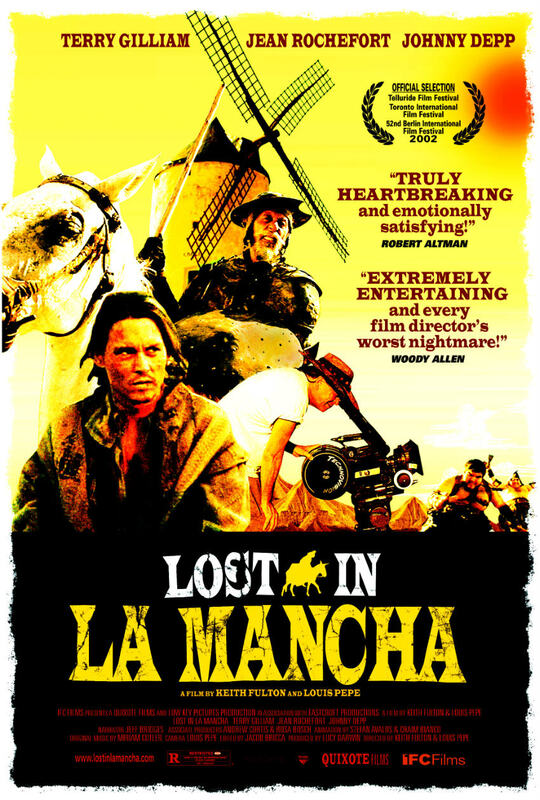 Lost in La Mancha. Low Key Productions 2002. For years, Terry Gilliam has wanted to make a Don Quixote movie. And for decades, it’s been in development hell. Except once, it actually went into production. And never came out. This is the story of Terry Gilliam’s impossible dream. I always thought Gilliam made this documentary himself when production fell apart, but it’s attributed to a couple of other directors. Makes sense, I guess. He’s too busy making weird movies (or at least trying) to make a documentary. Apparently the title for Gilliam’s movie is The Man Who Killed Don Quixote. I always thought it was going to just be Cervantes’s story with a Gilliam bent, but that title sounds like he intended to at least tell a new frame story. I am unfortunately not familiar enough with Quixote to know how the original story ends, but I expect it’s a classical tragedy. So it might yet not be an original story on Gilliam’s part. After a decade of development, Terry Gilliam has finally managed to secure backing and casting for his adaptation of Don Quixote. Notorious for budget overruns on films too risky for Hollywood, he’s had to accept a budget of half what he hoped for, on a schedule stretched just as thin. But he has his dream Quixote in French actor Jean Rochefort, who has the look, dignity, and comedic timing he wants, and who even spent months learning English to do the movie. He has box office draws in the supporting cast like Johnny Depp, and he has a team of European filmmakers and his close colleagues. Costumes and test footage look amazing. Then production starts, and calamity after calamity strikes. Every production has setbacks. But a production built on so many compromises from the start just can’t be resilient enough to meet so many. This is probably painful to watch even without a background in film, but this documentary shows a production plagued from the beginning, even before the disaster of a first week and problems with cast availability. That first day is brutal. They ship out to an exterior location, discover that their extras are unrehearsed for a choreographed scene, learn that of course they were misled about how often NATO uses the nearby bombing range (compromises, compromises), and then… God Almighty weighs in on Gilliam’s filmmaking. And yet with their already ridiculously tenuous plans in shambles on day one, the show must still go on. I don’t know how you come back from that. Apparently, neither do they, but they try anyway. The film and Gilliam make much of a “Quixote Curse”, but only one example is offered: Orson Welles’s passion project that he kept working on for years after the death of his star. But it looks like there are plenty of examples of successful mountings of Quixote. The disasters of the movie could have been avoided if more compromises were made on the creative side and fewer on the business side, but this is beyond just gambling that everything will go right and it doesn’t. This is beyond the typical struggles of a Gilliam film. If the story isn’t cursed, this script in particular is. As someone not involved in or interested in the financial and legal side of the film industry, I don’t have any problem understanding the movie being subject to unhappy investors and insurance settlements, but I’m baffled at what kind of arrangement could result in an aborted project turning over the rights to the script itself as, I guess collateral to the insurance company. Especially since it sounds like they’re just going to sit on it without trying to sell it to anybody, which is the only use I can think of to acquire the rights to a script one has neither the equipment nor the inclination to produce. My best guess is that the idea is that they’re holding it instead of a cash forfeit, since Gilliam was able to buy it back from them. And move on to being further cursed by it. I feel like there’s an attempt to parallel Gilliam’s journey on the cursed production with Quixote’s misadventures. But I don’t think it was very well-made. It directly states the commonly known idea that Gilliam’s movies are about dreamers that express elements of himself, and then… his uncompromising vision is his tilting at windmills? He’s playing at making a film without prudence? He doesn’t get along well with reality? There doesn’t seem to be a strong thematic point. There doesn’t have to be, but it seems like there wants to be. Essentially, all this is is the chronicle of a production that hit a string of merciless bad luck and failed. That’s a story that isn’t often told, and one that is important for filmmakers to see. All of the productions I’ve been on of varying sizes have had their problems to solve, and they’ve seemed better at solving them, but they also didn’t have the scale of the problems. I don’t think Gilliam is ever going to give up on this dream, but I also don’t think it’s ever going to be realized.